There are mainly three parts in laser engraving machines and each of them performs a specific task. The laser emits the beam, the controller helps in controlling the direction, speed and intensity of the laser. And the surface allows the pattern to be traced on it. Laser engraving machine are mainly of three types. The first type is the X-Y table which involves a stationery workpiece but and a moving laser tat moves around in X and Y directions drawing vectors. Another type of laser engraving machine is the one which is mainly used in cylindrical work pieces. In this case the desired image is produced on a raster basis. The third mode is the one in which the laser and the workpiece remains stationery and the galvo mirrors helps the laser beam over the work piece surface. Laser engraving machine s are used for a variety of uses even for industrial purposes. It is used for printing dates, expiry codes. Moreover, laser engraving makes it possible to mark various plastic material. These feature makes it very useful in various packaging and bottling plants. 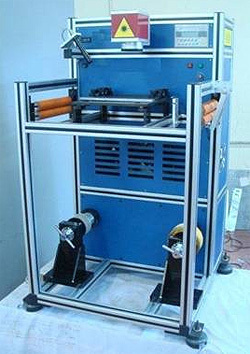 Equipment with laser (Diode-Pumped Fiber Laser) for hologram marking etc on the Holographic sheets, with marking field size up to 300 mm x 300 mm and having latest Pentium 4 computer & required software and attachment for marking holograms in sheets to sheets and roll to roll form. Guaranteed for 50000 hrs. Operation of laser. Latest Pentium 4 computer with monitors 2000 operating system. Flat screen TFT monitor. Window based software and also offers direct screen software which accepts DXF, WMF, JPG, BMP or HPGL and more files for marking, can accept output of any popular software like Corel, AUTO CAD 2000, etc. Graphical user interface on screen display of marking field and object. Importing both vector based and bitmap file formats directly into marking software, input Directly from scanner. Increased Test formats, including true type fonts, 23 bar code formats and 2D matrices. Variable text including keyboard input, detail time coding, and scanner of other RS232 input and alphanumeric serialization. Marking software, laser disabled for offline programming is also supplied. Included is vertically adjustable ‘Z’ axis platform, which can move job fixtures, Plates, objects (max. 25Kg. Wt.) into focus field of Galvo. Maximum Z travel is 300 mm.